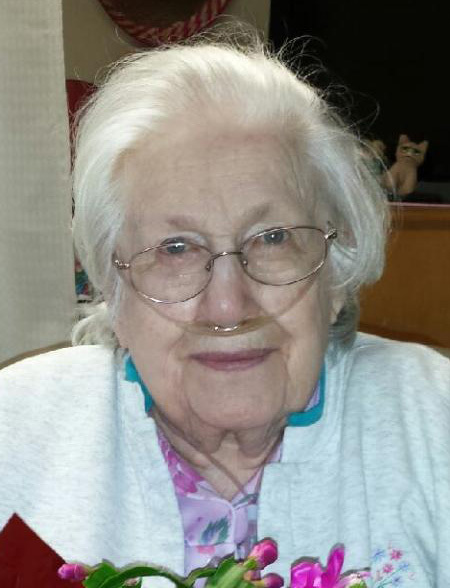 Dorothy M. Purtilo, 98, of Newton died on Thursday, April 4, 2019, at Newton Health Care Center. The family will greet friends from 1-2 p.m., Monday, April 8, at the Wallace Family Funeral Home and Crematory. Immediately following the visitation there will be a graveside at Newton Union Cemetery. Memorials to Hospice of the Midwest may be left at the funeral home the day of the service. Dorothy, the daughter of Forrest Courtney and Hazel Lucetta Soule, was born on December 16, 1920 in Minneapolis, Minnesota. Dorothy is a descendent of George Soule who came to the United States on the Mayflower and signed the Mayflower Compact. Growing up, Dorothy attended school in Hayward, Wisconsin, graduating in 1939. After high school, she worked in the Civil Service office in Hayward and later at a dentist office. On September 8, 1942, Dorothy was united in marriage to Arthur Purtilo. In October of 1942, Art enlisted in the service and the newlyweds moved to Chicago. While in Chicago, Dorothy worked at Hamilton Lampshade Company making radio crystals for the military. In March of 1944, they moved from Chicago back to Hayward. Shortly after moving back to Hayward and after Art was shipped overseas, the couples’ first son, Gary was born. In December of 1945, Art was discharged from the service and attended and later graduated from the University of Minnesota in 1947 with a degree in engineering. During that time, Dorothy stayed in Hayward. In 1946, they were blessed with their second child, Denny. Art and Dorothy moved to Newton in September of 1947 so Art could take a job at the Maytag Company. In 1951, they welcomed their only daughter, Judy, to the family. In addition to raising the children, Dorothy worked at several retail stores in Newton including Sears, Singer Sewing Center, and Newton Office Supply. She also sold Tupperware and Vanda Beauty supplies. Dorothy was a member of the Congregational Church in Newton and also belonged to the American Legion Auxiliary for a short time. In 1988, Dorothy moved into McCann Village and assisted in keeping the library there neat and orderly. In 2015, Dorothy moved to Newton Health Care Center. Dorothy loved flower gardening and enjoyed raising African Violets and Orchids. She also liked putting together puzzles, playing keyboard, and her pets. Dorothy is survived by her children, Gary (Connie) Purtilo of Bellevue, Denny (Kay) Purtilo of Newton, and Judy (Doug) Theis McCart of Corydon; grandchildren, Rod Purtilo, Terry Purtilo, Michelle (Brad) Theis Stalzer, Karen (Brian) Purtilo Finch, Chad (Raejean) Theis, Kathy (Randy) Purtilo Plumb, Stephanie (Rodney) Theis Annee; her step-grandchildren, Jon (Shannon) McCart, Kelli (Mike) McCart Talcott, and Melinda Wickliff; 12 great-grandchildren, Maggie Hummell, Dakota Theis, Zachary Theis, Trenton Theis, Logan Theis, Bryar Annee, Morgan Stalzer, Sean Finch, Madelyn Pickett, Troy Finch, Ashlyn Finch, and Brylyn Finch; her six step-great-grandchildren, Guy Talcott, Ronin Talcott, Kylie Talcott, Ainsley McCart, Brandon Wickliff, and Cameron Wickliff; two great-great-grandchildren, Emmett Hummel-White and Cleo Theis; her sister, Lorraine C. Olson of Saratoga, California; and many nieces and nephews. She was preceded in death by her parents; husband, Art Purtilo; a stillborn sister; grandson, Kevin Purtilo; and daughter-in-law, Barbara Purtilo.